Li is particularly keen to attract investment from across Europe, including Central and Eastern Europe. "What we can offer European companies is the sort of market they might not be able to get at home, with the huge local population and also potentially the whole of China," he said. "We are very open about companies coming in here wanting to form joint ventures or some form of cooperation arrangement. We want to attract top industry teams to Chongqing." Jefferson Wang, head of the Greater China government and economic development practice for management consultants A.T. Kearney, said Chongqing, despite being one of the biggest cities in the world and China's wartime capital, is held back because it is not well-known internationally. "It is certainly not as well-known as Guangzhou (the capital of Guangdong province) or a number of other Chinese cities and I think this holds it back a little. It is a major challenge for the local government to do more on promotion," he said. "The Belt and Road, however, is a major opportunity since it (Chongqing) is the center of the west of China and can really open up the region as a logistics hub." Wang said it is important not just to focus on railways, with aviation being equally essential. The third terminal of Chongqing Jiangbei Airport opened in August last year and the aim is for the facility to became a major international hub and the biggest airport in western China by 2030. Wang said that of the 69 international routes operating from the airport, 44 are linked to countries taking part in the Belt and Road Initiative, adding, "There is huge potential here." Logistics are vital for Chongqing, as it has emerged as a major manufacturing center. A significant proportion of China's manufacturing has moved west from the east coast and southern China, where the country's economic transformation began 40 years ago after Deng Xiaoping's Reform and Opening-up Policy was launched. Shi Rui, deputy director of the modern service industry department at Chongqing Liangjiang New Area Investment Invitation Group, said logistics have previously held the city back. "It has always been very challenging for us. We have a local saying that it is easier to get to heaven than out of Chongqing because of the mountains. 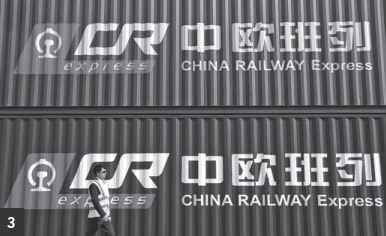 So, for the past 20 years, Chongqing has invested heavily in logistics infrastructure, developing the airport and establishing railway connections," she said. One-third of the world's laptops are made in the municipality with Acer, Asus, Toshiba and Sony all establishing major operations in the city.